The person who shared this with us wanted to remain anonymous, but wanted to share something that some of us will be able to relate to. 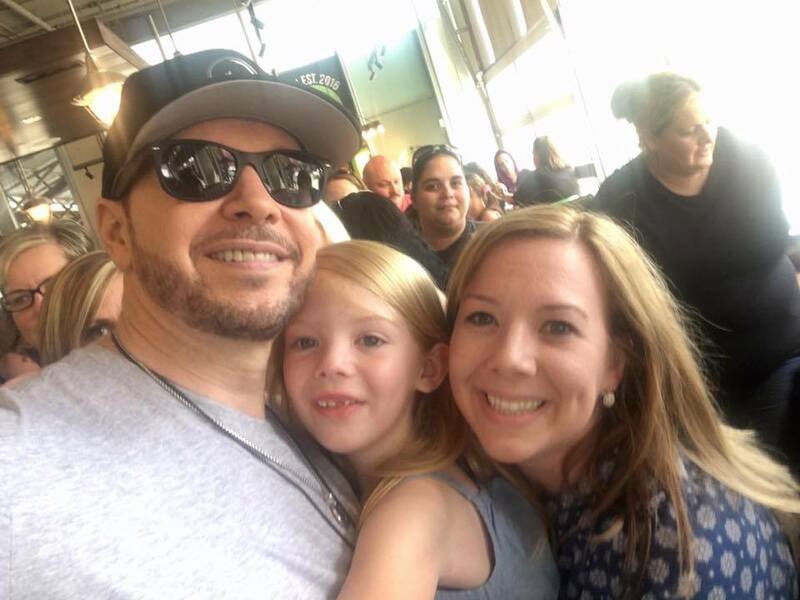 As Donnie has said, everything happens for a reason and as you will see, a simple kind gesture from Mr. Donnie Wahlberg himself and other events that transpired throughout this person's experience brought them out of the dark. I don't normally get too personal, but since you mentioned "meant to be", I had to. It's been a heartbreaking 7 months for me since I lost my mom. She was my best friend and at times, my only friend. When I was a child in the 80s, she was a single mom and struggled but somehow made sure I had anything NKOTB I wanted. She always wanted me happy no matter what the cost and was thrilled when we purchased tickets at the beginning of November to attend the ATL concert. Unfortunately, she passed away unexpectedly November 28th. As you can imagine, I didn't really want to go but my friend talked me into it. Our sweet husbands drove the 3 hours and brought us. We got stuck in traffic on the way to Wahlburgers but made it. They weren't letting anyone else in. About that time, you walked out the front door, to the golf cart. At first, you said you had to go so you couldn't snap a pic. I'm not sure why, but you turned around and took that selfie with me. Fast forward to that night, my floor seats were directly behind the box Danny stood on and he hugged me. Before this strip, I was so deep in despair, I wasn't sure how I was going to continue and didn't want to, but that day I felt true happiness again. You guys saved my life. Had I not been stuck in traffic, had you not walked away from that golf cart, or if my seats where anywhere else in that venue, these events wouldn't have taken place and I'm not sure I'd be here to type this. From the bottom of my heart, thank you. This is my story. I can always add more to it but I think this is the core of my story. How I found my light again. I'm including a few of my favorite pictures from along the way too. It might sound crazy now, but I wasn’t a fan of NKOTB in my younger days. In fact, I became a fan of Donnie Wahlberg because of his work in Band of Brothers. Once I joined the age of Twitter, I followed Donnie and as many Band of Brothers actors as I could find. 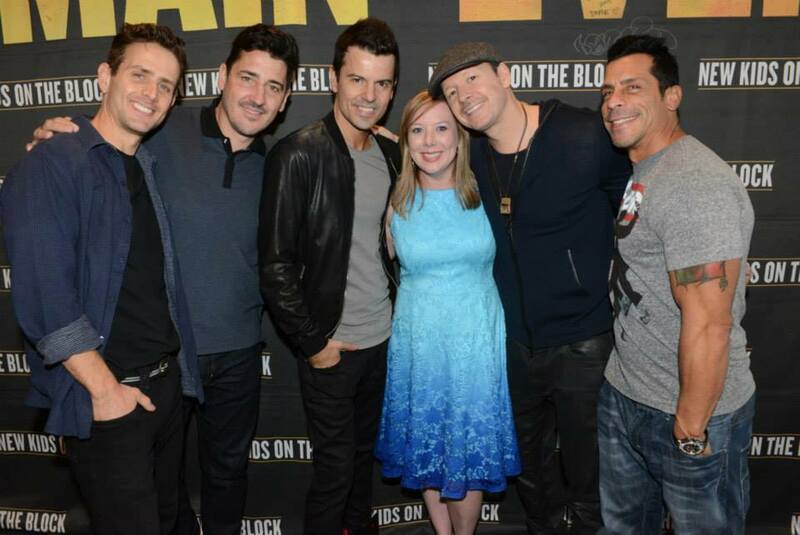 Then on June 19, 2013, a friend gave me a free ticket to the New Kids on the Block concert in Charlotte, NC. The show was that night and if my seat were any higher, I would have been sitting outside on the roof. I was literally in the last row. That did not matter one bit! I was thrilled with the idea of seeing an actor I respected so much, even if he was the size of an ant. In 2010 after the birth of my daughter, I suffered from post-partum depression. It was so severe that I began plotting my own suicide. With the support of my family, medication and therapy, I was able to find my way again. Or so everyone thought. The medication that was keeping me alive caused rapid weight gain. 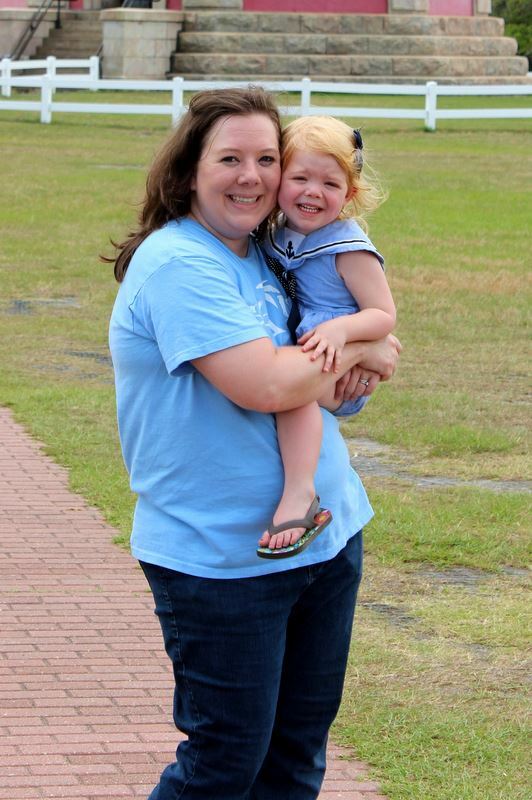 As I was finding my way as a new mom, I was losing every bit of myself. Or who I had been before I became Abbie’s Mommy. I did everything I could to keep from being noticed. I wore clothes too big for me; I truly “let myself go.” My thought process was that once I wanted to die, maybe I didn’t really deserve to live either. I might have been present in body, but my soul was slowly dying. The night of the concert, I took my seat in the last row of the arena and it occurred to me that I was also sitting in the last row of my own life. When New Kids came out, the only way I know to describe the feeling is that I felt myself breathing again. I could feel life in my body again. That night and that free ticket changed the course of my life forever. 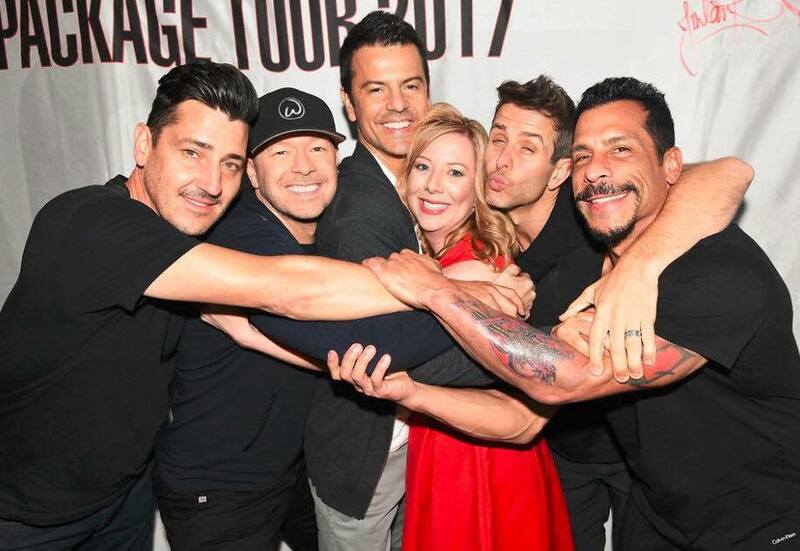 After the concert, I went to Twitter and found the amazing NKOTB fan community there. I started making friends. Those friends were unlike anything I had ever experienced. They thought I was beautiful just as I was yet they encouraged me as I began my transformation into the person I wanted to be. They kept me accountable as I began eating healthier and started exercising. The scale started going down and my confidence began to go up. I always say I did the hard work but NKOTB was the catalyst to helping me believe in myself again. For that, I am forever thankful. They say that once the exit door registers for you, you always know it’s there. I still have good days and hard days but I no longer fight alone. This is the gift that New Kids on the Block gave me. I might not have been around for the first time around, but I truly believe that I found NKOTB right on time. It was October 26,1996 and i heard on the radio that there was going to be a make a wish event in Kendall Florida, like 20 minutes away from where I lived. I was so excited that I called and found out certain celebrities were going to be there I asked who specifically and they mentioned Jordan Knight and I asked anyone else? They said Donnie Wahlberg I was like oh my god! Donnie! So I asked my mom and thinking my mom would say no, but she said yes!!! It was raining too but I was on my way. Got there paid $20 VIP ran into my fave radio personality, asked her if she could hook me up with meeting Donnie and thinking she wasn't able, sitting there chilling and with the corner of my eye saw a silhouette coming towards me and I freaked out DONNIE!!! I made him a banner that read Donnie you'll always be #1 in my heart, made a card for Mark but he was working on a movie. He came to me and made me feel like I was the only girl in the room, I told him he made my year he interrupted me by saying No you've made my day with the day that I've had, held my hand as he said it too! Saw Jordan chilling on the other side of the ramp I called out to him he looked around like who's calling me? And finally saw me and came and gave me a hug signed my book and we talked a bit. My name is Jamie Titus Silvers on Facebook. I LOVED New Kids in the 80's and the 90's, but my parents had no money to buy me anything or go to concerts. I think I was 14 in 1990. I don't remember what year the New Kids 900 number came out. My friend and I wanted to call it. My understanding was that if you called and stayed on the line for less than a minute you would not be charged. So I called and would set the microwave timer to less than a minute. I called once or twice a day for multiple days in a row, just to hear their message. Well, when the phone bill came there was a long line of 1-900-909-5543. I was busted! I had to pay my parents back for all those charges. This happened in Richmond when I was 10 years old. My mother was driving her brand new Mazda 626 with sunroof around Richmond before the show that night. Well we got to a stop light and my mom looked over and saw two people on motorcycles. One of them had a rat tail coming from the helmet. My mom calmly asked me to look over and see if that was Donnie and Jordan. I freaked inside (being 10 and crazy in love with Donnie I was freaking out a bit) so she proceeded to follow them (no worries my mom is far from a stalker) well when they realized they were recognized they went down a street to lose us. With us being from Virginia Beach we did not know the area at all so we still followed and ended up down a one way street. My mom had to turn into the other place she could and it was a motorcycle shop. I was a bit disappointed 😔 but to my dismay my mom noticed the two motorcycles sitting on the side of the building. She then noticed a limo. My mom and the driver were talking and she just explained the situation and that wasn't any expectation to follow them there we just happened to turn into that place due to it being a one way street and us being from out of the area. She politely asked if we could meet them. The driver said as long as we didn't take long it would be fine. I had a friend with me (Courtney) it was my moms friend who was also with us. Donnie and Jordan came out to the car and my friend and I sat in the back seat embarrassed and nervous that we would be in trouble lol. So they were talking to my mom and her friend and Donnie was saying how much he loved my moms car. He sat in the drivers seat. Jordan was standing against the drivers side looking down into the sunroof. Jordan began singing "I'll be loving you forever" over the sunroof. My mom had a camcorder in the trunk but being so star struck she didn't even think about getting it. I have always wanted to know if they remember this incident. I know they have met A lot of people and in some crazy ways but to me this one is one I will never forget. The first time I saw them was in Ottawa in 1990 I think. I like every other teenage girl was obsessed. I had the sheets, the dolls, the posters and the buttons. They split up and faded away like most fads do. I grew up and never really thought much about it the stuff got sold in yard sales and packed in trunks. Then one day I was listening to the radio and I heard summertime, before they even said it I knew exactly who it was. I had no idea they were back together! Then when they were touring with the Backstreet Boys my friend and I talked about going and reminisced but never did end up going. It wasn't a big deal it was just a bit of nostalgia right? Then came the main event tour and I said what the hell lets go. That one concert was what did it. What brought me back to my teen years and sparked those old feelings but something new too. Gone were the days of crimped hair and big buttons and left behind was a new found respect and admiration on both sides of the stage. We weren't kids anymore not us not them. We knew what we had was precious we'd lost it once but we're determined to cherish it this time around. Like I said that moment was it for me. My friend and I booked our first cruise and if you've never been there, there is just no way to tell you how amazing it is and the energy and love that's on that boat. Everyone should experience it. Next I decided to venture to NYC in hopes of seeing Donnie on set. I had never been there and knew that even though it was a long shot it was worth the 6 hr drive. Somehow I just knew. As I'd hoped we got to see Donnie, and as a bonus Will Estes too :) Donnie stood talking to us for quite awhile taking pictures and even making a video for my friends brother, Corky. My friend who was with me had never been to a NKOTB concert so Donnie gave us tickets to the Newark show. The whole time I was at that show I felt nothing but gratitude not only for what he had given us (the tickets) that night but what he gives us every single concert, show or meeting. I meet him at the Buffalo show as well. We waited by the buses he pulled in looked right at me (I was the only one standing in that area) he smiled at me and waved then came around to take pictures with everyone. No one on the outside will ever understand and that okay. I've tried to tell people it's so much more than just a band. They are our family I don't care how crazy it sounds. I love these boys with all of my heart and always will.